Stunning onyx box / case with lapis lazuli and sterling silver. Marked Asprey and dated 1925 London Pure quality that is immediately evident when handling this beautiful onyx & lapis lazuli trimmed box. With silver hallmarked hinge dated London 1925 retailed by Asprey, London. Silversmiths hallmarks looks like : C.L &S into an oval, Charles Lyster & Son. Conditions can be seen on the pictures, it has some cracks and some minor chip. 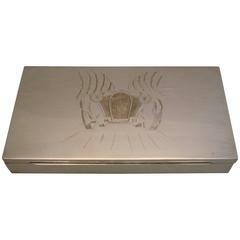 Fantastic engraved Cigar - Cigarette case with a Bugatti Royale. Bugatti type 41. Very nice piece of automobilia. 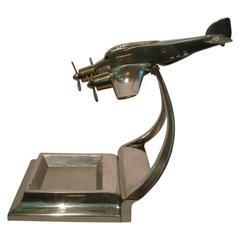 Perfect gift for a Classic car or car mascot - hood ornament collector. 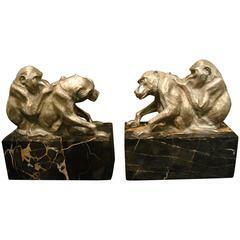 Very nice Art Deco bookends, pair of monkey’s figures. Mounted over a very heavy Italian marble. Perfect to use for heavy books. Signed Bourcart, France, circa 1925. 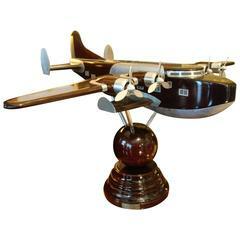 Very nice Art Deco bomber. Made of aluminum. The inside part of what looks like an ashtray or something for coins or little things is painted in aluminum color. Perfect for a desk. Garrard & Co. Ltd., Asprey & Co.